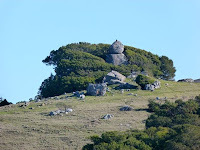 There are many interesting hiking areas that connect to the San Francisco Bay Trail. The Ring Mountain Open Space Preserve (part of the Tiburon peninsula) is one such spot. Perhaps the best access point is one that connects indirectly with the Bay Trail via Paradise Drive. Although Ring Mountain is not marked as part of the Bay Trail on Bay Trail maps, this access point is close to where the dark green dotted line (undeveloped trail) turns into a solid green line (Bay Trail) in near Corte Madera. I had heard many good things about the trails on Ring Mountain last time I walked through Marin County (during my first walk around the Bay 2009-2011), including reports of ancient petroglyphs (rock carvings), interesting boulder formations, as well as great views of the Bay and the surrounding hills. So, this time around I decided to investigate. Thank you to Ellen for hiking company today. 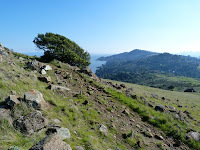 We started our climb up Ring Mountain via the trailhead that was accessible from Paradise Drive (near the Tiburon - Corte Madera border). We passed one or two small streams that we could cross easily, and followed a few different trails over a 3 hour period. 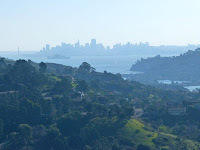 While hiking to the top, we enjoyed views of Richmond, the Brothers islands and the Richmond-San Rafael Bridge to the east. 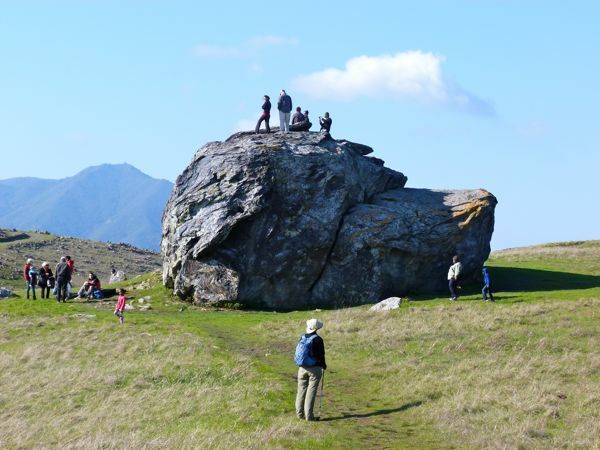 As for rocks, this is a great place to find very interesting ones. A few minutes later, I was struck by a rock formation that looked a little like a sitting buddha statue, and later in the afternoon we passed by turtle rock, that looked -- yes, like a large stone turtle (with tiny people climbing on it). We enjoyed lunch perched up high, looking down on Tiburon below and as far as the San Francisco skyline in the distance to the south.